Cheongsapo Daritdol Observation Deck is an exciting new structure for leisure in Cheongsapo area. It gives you an exciting wider view of the ocean and the unique beauty of the mainland’s coastal areas. I highly recommend this place for a short visit to enjoy the sea and the health effects it can give one. Experts say that the blue sea can heal one’s various sorts of health issues. Such health benefits may include relieving stress, boredom, heart, and other physical and emotional issues in the long run. I believe it is so! Now, aside from those personal thoughts, Cheongsapo Daritdol Observation Deck is exciting and inviting especially when you are near the area. 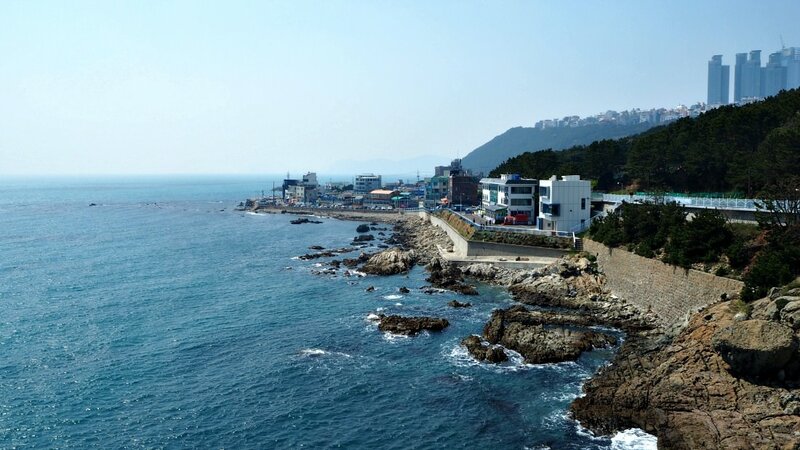 It is only around 20 minutes from Seongjeong Beach area, a beautiful destination for summertime (even during other seasons due to its enticing environment). This facility is located less than kilometers away from commercial facilities (such as coffee shops, restaurants, etc.). So, please do not expect that you will find useful facilities within or around the observation tower. You cannot even find a restroom (washroom, loo, etc.) nearby. 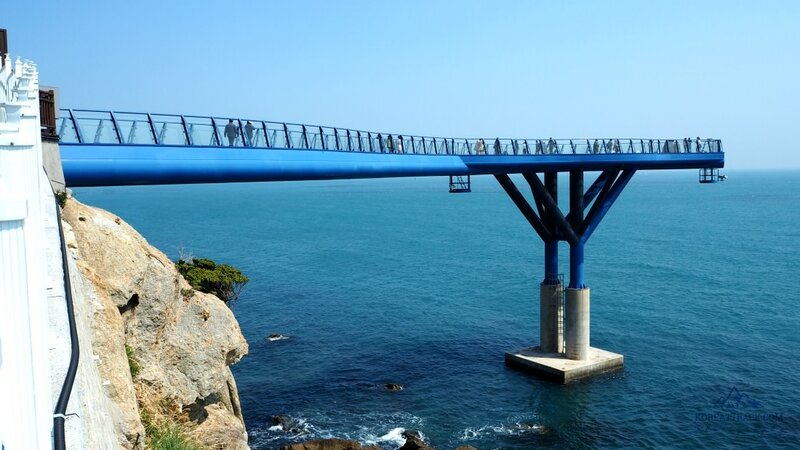 The observation deck is purely a place to observe the surrounding views--the main land’s rocky face and trees, the fantastic view of Seongjeong Beach area, the islands in the distance, and the aquamarine water 20 meters beneath your feet! The whole structure is about 72.5 meters long stretching from the rocky cliff of the mainland. The length gives you the thrill as you walk over the transparent glass while the strong sea breeze is blowing. If you come early, you will have a fantastic view of the sunrise. And in the late afternoon, you can experience the mesmerizing colors of the sunset. By the way, to protect and maintain the transparency of the glass floor (in some areas), you are required to wear a pair of shoe covers. The shoe covers also function as non-slippery gear as their rubberized materials on the bottom parts. These are provided for before you enter the observatory. I got here by walking from Seongjeong Beach area (and from another place before that beach). It only took me around 20 minutes via the coastal pathway. By bus, you can get here by taking the Maeul Bus (village/neighborhood bus) No.2 from Jangsan Metro Station near Exit 7. Then get off at its last stop--Cheongsapo Bus Stop. Find the retired seaside railway (Donghae Nambu Railway) and simply walk on the set up wooden pathway (and bridge) that leads to Cheongsapo Daritdol Observation Deck. 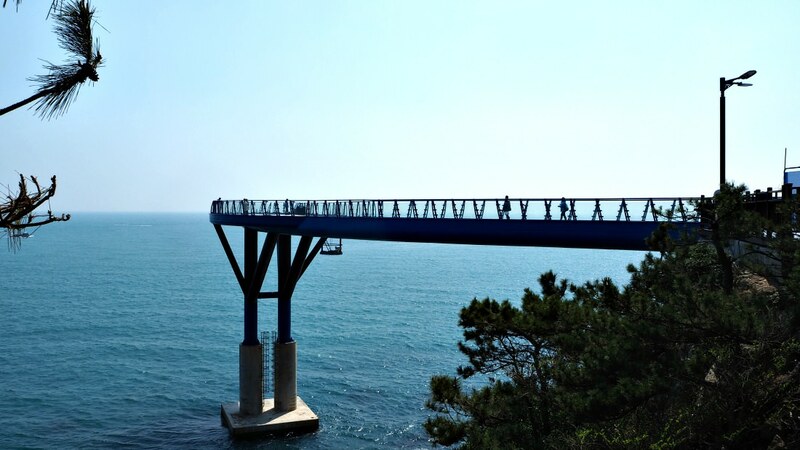 The observation deck is located just around the middle of that railway in between Mipo and Songjeong. Busan City Tour Bus also stops at Cheongsapo. So, if you signed up and taking this bus, you may get off at Cheongsapo and explore this area. If you are driving, you can avail the parking area at Cheongsapo Public Parking Lot. The observatory deck is Free for all visitors. Regularly opens from 9 AM to 6 PM. During summer time (June to August), it is open even until 8 PM. Thanks for reading through this article. If you found this useful, please share it with friends or family members.